IVF patients understand that their treatment’s success is the result of the combined effort of the doctor and the patient herself. They know that they can play a vital role in ensuring IVF success. This is why infertile couples gather as much information about IVF treatment before starting a cycle. They weigh their options well and judge what is best suited for them. Based on this research , they take efforts to find the best IVF specialist. Given this background, and the amount of time, energy and effort patients invest in IVF treatment, it is surprising to see how apathetic patients are towards seeking and obtaining the medical records of the IVF procedure. Even well educated and aware patients do not have a copy of their medical records, even though they know that good documentation is important for any medical procedure – and especially for one which is as complex as IVF . The benefits of proper documentation accrue over a long period of time , and are equally beneficial to the doctor as well as the patient. Some IVF clinics put forth the specious argument that they do not share medical records with the patient as IVF maybe a long drawn out treatment and that if the first cycle of IVF fails , then they need to refer to the records to plan further treatment. But this does not justify why the clinic cannot provide a copy of the records to the patient ! Others claim that there's no point in providing these to the patient, as they are full of technical medical details, which the patient will not be able to understand ! This is unfair, as IVF patients are well-informed these days - and it's part of the doctor's job to explain these details to the patient ! Some clinics try to hold on to the patients by holding on to their records. It is obvious that it’s much harder for a patient to go to a different clinic for consultation , without her medical reports. If a patient’s IVF treatment cycle fails and she is not provided with the records, she will find it difficult to get a reliable second opinion without good medical documentation. This cheap trick causes the patient to lose trust in the clinic. Patients are also at fault for not asking for their own medical records. They need to know that they have a legal right to their IVF medical records , and no one can deny them this right. It is important that they have a written proof of the procedure performed, with all the medical and lab details, including embyo photos. If the clinic does not provide the records proactively, the patient should ask for them. This request should be made in writing, to ensure that it is not conveniently ignored by the clinic ! 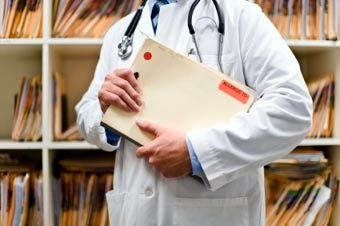 Sharing medical records helps in building a mutually trustworthy long term relationship between the doctor and patient. The medical records of IVF treatment are important documentation , and it is essential that the patient always has a written copy of every detail of the procedure. Need help in making sense of your IVF medical records ? Please send me your medical details by filling in the form at http://www.drmalpani.com/second-opinion so that I can guide you better !